There is no doubt, none that is reasonable. Our planet is warming, skewing the delicate balance upon which humanity relies to survive. The cause of that warming is us, and our reliance on fossil fuels to drive the wild rushing busyness of our commerce. There is, again, no doubt about this. None. It is happening, as certainly as Titan orbits Saturn. There are those who do not believe it is occurring, certainly. This is as meaningful as saying "there are those who believe that the Earth is flat" or "there are those who believe that the Clintons run a child-slave-ring out of the basement of a neighborhood pizza restaurant." Reasonable doubt is my standard, not the doubt that rises from obvious psychosis. The question now: what to do about it? Some would argue that we need regulation, that we need to throttle back the natural energies of the global marketplace with government imposed restrictions. We do not need to do this. We can simply let the market do what it does, and the problem will be solved. Markets, after all, operate on principles closely aligned to the organic processes of evolution and natural competition. Unlike the rigidity of state systems, they are existentially connected to nature itself. This appears to be the choice we Americans are making, and I am confident that it will ultimately solve the problem. What does that solution look like? Let me show you an example. This is a GMC Yukon. It's a full-sized sport utility vehicle, one produced by General Motors. GM, along with Ford, have recently abandoned the traditional car in favor of doubling down on SUVs. Why? I found out recently when I rented a Yukon for a day. It was big, vastly bigger than my Accord hybrid sedan, so large it didn't fit into my car port. The Yukon was comfortable and powerful, with a large V8 engine into which one could dip for a nice surge of acceleration. In daily errand running, it consumed fuel at the rate of around 14.8 miles to the gallon, rather more than the 49.5 that my Accord gets on average. The interior space of the Yukon is as wildly inefficient as the rest of the vehicle, with a vestigial third row that is unusable by adults or children older than ten, and about half of the cargo space of our six year old used minivan. Purchased new, a mid-level Yukon equipped as the one I rented comes in at around sixty-two thousand dollars. They sell like hot cakes. When we purchased our car a year and a half ago, my Accord hybrid had been sitting on the lot for nearly eight months, and we got it brand new from the dealership for thirty-two thousand dollars out the door. In fact, purchasing the Yukon would cost you more than it cost my family to purchase our hybrid, our minivan, and my motorcycle. Combined. It is immensely profitable. 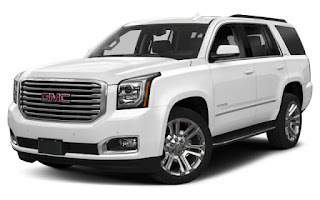 Buying a Yukon seems, if avoiding climate change is a goal, precisely and exactly the wrong thing to do. But people like to feel big and powerful. We like to feel like we are dominant. It makes us feel safe. It makes us feel in control. The market acknowledges and affirms those desires. Which is why the American factory producing Accords like my own was idled last week, and the factories making Yukons can't make enough. The market, being driven by forces similar to those in nature, is simply doing what natural selection does. We prefer power, and so our markets keep us aligned with that preference. How, you might ask, does this solve the problem of climate change? Simple. It means that, driven by the marketplace, we let the process of natural selection continue. We will consume fuel as we wish. Although we run out of gas under American soil in 10 years, Venezuelan and Russian reserves will last us another seventy years at current consumption rates. Eventually, faced with genuine scarcity, we will become more efficient. But that will be too late to stop the process of a changing planet. The climate will change, with increasing rapidity. Storms and fires will increase. Sea levels will rise, inundating our coastal communities. Tropical agriculture will collapse, and billions of human beings living near the equator will either die of thirst and starvation or flee towards the poles, where of course we'll meet them with open and sympathetic arms. Humanity will find itself in a time of crisis, upheaval, and death, with only a very few of the powerful and wealthy sheltered. Perhaps. Or perhaps we will not survive at all, as mass extinctions shake the complex ecological web in a way we do not anticipate. This is how nature solves the problem of maladaptive species. It allows them to die, and replaces them. This is the market solution to the problem of climate change. Is it kind or good? No. Is it wise? No. Is it horrible? Yes. But it does solve the problem.